We recently posted about teachers using red ink at school, and that put me in mind of another classic colour debate: Blue or black ink? There are all sorts of opinions on this and, for the most part, it just comes down to preference. That said, there are some very valid reasons for choosing one or the other, particularly in certain circumstances. Black ink for filling out official records. Blue for business signatures and most others. Black for memos and work correspondence. Blue (or red) for notes and most learning purposes. Blue for credit card applications. Blue (or another color) for creative purposes. Let’s start with black ink. This seems to be the default ink for most business settings and especially government offices. For example, if you’re applying for a job at this security firm, you’re instructed at the top of every page to stick to black ink. Visa applications with the Home Office must also be submitted in black ink only. Federal courts in the US are the same, insisting on black ink for official documents. The main reason has to do with copying and digitizing documents. Black ink just scans better than blue, which tends to show up very light. I think this is true more of older and less expensive copiers and scanners, but those are probably more common anyway. So, just to be on the safe side, you probably should use black ink whenever filling out or signing legal and/or official documents, unless told otherwise. Also, use black ink to vote. After pencils, black pens are the recommended tool for voting for the UK. And some voting machines in the US have even been known to not count votes cast in blue. There’s also the widespread perception, right or wrong, that black is simply the more professional ink colour. I read one person lamenting on a message board that everyone in her workplace used black ink at a meeting, except her. Once she realised that and saw others eyeballing her blue handwriting, she decided to switch to black. (For business purposes) black remains the most correct and distinguished choice. Blue is very much in second place and is thought more suitable for women than for men. Blue-black is only appropriate for schoolboys. Coloured inks, although more acceptable than before, are still considered very suspect in traditional circles. The sexism aside, I can see how black ink is perceived that way. It has a more sober, serious appearance and its solidness communicates stability in ways that lighter colors don’t. But don’t count blue out yet. Turns out that it has a lot to recommend it over black. While many official documents must be written in black, blue is actually the smarter choice for signatures. Copiers can make such high-quality copies now that a document signed in black ink and a copy of that document are often indistinguishable. That’s why even the US military recommends that original documents be signed in blue, so that they stand out from any reproductions. There’s an interesting side-note to signatures written in blue ink. Marketing research has found fairly consistently over the years that fundraising letters, questionnaires and other materials often get more and faster responses if they bear a handwritten signature in blue, versus typed or signed in black. Blue ink may also be the better choice for credit card applications and other financial papers. Investopedia writer Gina Roberts-Grey reports that applications and checks signed in black may trigger fraud alerts. That definitely had never occurred to me. 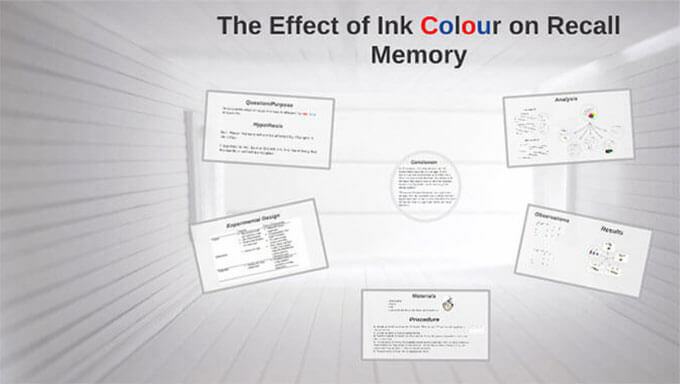 Neither had one of the most significant benefits of using blue ink: improved recall memory. Psychology research suggests that reading and writing text written in color increases the likelihood that you will remember that information. Most of the experiments so far have been fairly small-scale, but the results are intriguing. For example, one experiment with a group of male and female Grade 9 students found participants had greater recall with red text than blue, and greater recall with blue than with black (33% vs. 27%). Interestingly, a couple of the experiments I saw suggested that girls had better overall recall than boys when color was a factor. My own perspective on the blue or black ink question has started to shift of late, mainly because of an experience with blue ink. I typically use black pens – just because that’s what I’ve always done. Because I’m working on a novel, I keep a notebook handy to jot down ideas when inspiration strikes. One night recently, a thought occurred to me and I grabbed the notebook and my pen, a black Bic Velocity gel, off my desk. But the pen was out of ink. I wanted to get the idea down before it vanished, so I went to my pen drawer and grabbed the first one my hand touched. It was a Pilot Precise V5 with vibrant blue ink. When I started writing, a funny thing happened. That ink seemed to energize me. I wrote down the idea – and then kept going for three more pages, line after line of great stuff just popping into my head. Ideas that seem brilliant late at night often aren’t so much the next morning. But a day later, when I looked with fresh eyes at what I’d written, I was still pleased. Even better, it gave me more ideas. Turns out, my experience was not so unusual. While researching this post, I stumbled on a New York Times article about a study that found the color red helped people improve cognition and productivity, while the color blue sparked creativity. So now, while blue ink may not be right for every situation, I’m going to make sure I always have a blue pen close at hand for the many times it is. I definitely prefer blue, especially when filling in any documents: you can easily spot what is part of the document and what is filled in. Great article! I prefer blue ink because it stands out compared to most printed ink or handwriting since those tend to be mostly black ink. You write a nice overview of the pros and cons of both ink colors.